My grandparents were potato farmers, growing about 100 acres of Kennebecs on their farm in the Connecticut River Valley. When I was little we’d travel to help with the harvest except for the one year we were already there. That year my father left teaching to work on the farm year round and I remember our house sat right next to rows and rows of potatoes and we’d dig fingerling potatoes every night beginning in early July. My parents only had a cheap Brownie camera, however, so the only photos I have of this time are blurry black and whites. I ate potatoes about six days a week from birth until I left home. Actually, for a lot longer than that. I remember driving down to my grandmother’s house with my college roommate, Jose, right after harvest time. My grandfather had died so she was leasing the fields. We were poor and we figured the gas on the drive from Maine to Connecticut would more than cover the potatoes we’d get for free. 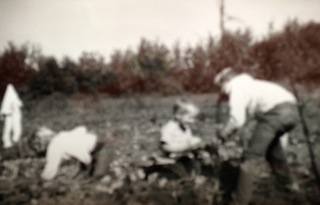 My grandmother promised us potatoes, but because she was leasing the land out, she felt funny just letting us glean the fields in broad daylight. As a result, Jose and I gleaned the fields by moon light. Unlike when I was younger when the tractor turned the earth over at harvest time, but the potatoes were hand harvested, the fields were now harvested entirely by machine and lots of potatoes were missed. In a couple of hours we picked over 300 pounds of potatoes, which got us through the entire school year. I get most of my potatoes now at the local farmer’s market from Olsen Farms in Colville. But because I use potato tops for my book presentations I’ve started growing a few in pots at my house, too. Digging them up last fall gave me the same shrill I remember having as a kid in the filed next to out house. It’s like digging up buried treasure. Slow Food Seattle is making Makah Ozette seed potatoes available to local school gardens. It’s a great way to teach children about the history of food, food culture, and many other topics. Contact Philip if you’re interested (readerstoeaters.com). On a final potato note, this is not the first time that seed potatoes have been made available to Seattle School gardens. While doing school garden research in the Seattle School archives I found out that in 1919, back when the school garden movement was booming, Seattle Schools bought 30,000 pounds of seed potatoes to distribute to the district’s school gardens. They also purchased 10,000 packets of seeds that year. School children grew over $100,000 worth of produce that year, which adjusted to 2013 dollars is about $1.3 million dollars worth of produce. It seems like we could feed a lot of people using school gardens if we made that a priority!